Reader's Digest/Taste of Home, 9781617657924, 320pp. All the classic, must-have recipes that every home cook should know! Meatloaf. Brownies. Fried chicken. Chocolate cake. Lasagna. Pot roast. Gingerbread. Apple pie. Chicken Noodle Soup. These are the recipes that every home cook relies on—the classics that form the cornerstone of American family cooking. Whether you’re a newlywed starting your own family, a graduate soon to be out on your own or an experienced cook who simply wants all the greatest hits—tested and perfected—in one convenient place, this volume is a must have. 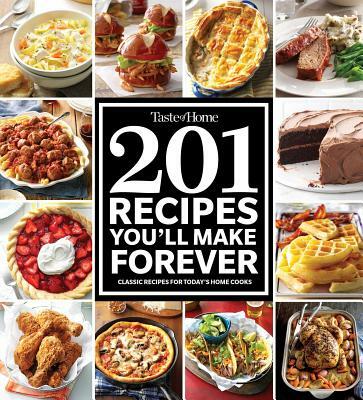 These recipes are the ones you’ll turn to time and again, and Taste of Home 201 Recipes You'll Make Forever is the book will be the one you continuously reach for. Taste of Home is the leading multi-platform producer of information on food, cooking and entertaining, serving home cooks engaging media that capture the joy and comfort received from food made with love. Taste of Home magazine has a circulation of 2.5 million and publishes Simple & Delicious magazine six times a year; top-selling bookazines; newsstand specials; and popular cookbooks.